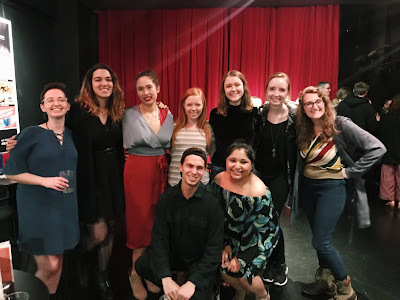 In Underneath the Lintel, playwright Glen Berger emphasizes the singularly human need inside all of us to leave a mark on the world, something that will endure long after our inevitable deaths. One of the ways in which he discusses this need is through graffiti—the unsanctioned, uncensored defacement of public property—and few examples of graffiti have ever reached quite such a memetic status as a little man called Kilroy. Kilroy is a simple cartoon drawing, a man seen peeking over what appears to be a wall with the words "Kilroy was here" next to it. He seems to have originated and became popular during World War II, appearing in unusual places, including the top of the Statue of Liberty. A famous tale claims that in July 1945, during the Potsdam Conference to discuss the end of World War II, Stalin had the use of an exclusive bathroom to which only two other people had access. It is said that Stalin exited the bathroom and immediately asked one of his aides, "Who is Kilroy?" Kilroy's omnipresence made him prominent in public consciousness during the 1940s, to the point where he is immortalized on the World War II Monument in Washington, D.C., purposely chiseled into the stone by the monuments creators. You could even purchase little clips of him to peek over your shirt pockets. 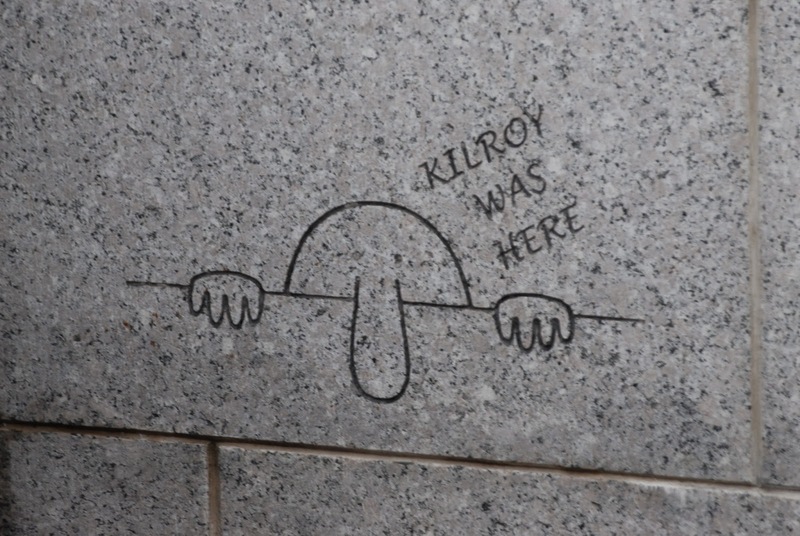 Despite being such an icon of the 1940s, the true origins of "Kilroy was here" prove difficult to track down with any certainty. It turns out that the phrase "Kilroy was here" and the drawing of the little man peeking over a wall originated in different places. In regards to the phrase, the most accepted origin was explained in 1946, when the American Transit Association hosted a contest to find out who Kilroy was. Many men came forward, but only James J. Kilroy (1902–62) of Quincy, Massachusetts, had evidence linking him to the meme. 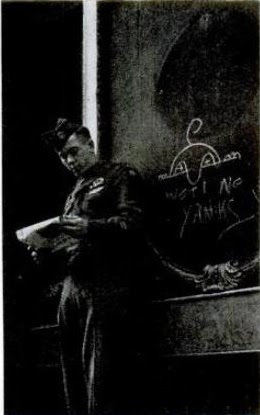 He was a welding inspector at the Bethlehem Steel shipyard during World War II who wrote "Kilroy was here" to mark the completion of his inspections; the ships then went out unpainted, so soldiers often saw the unexplained phrase during their deployments. To some it was a comfort, a lucky talisman that meant they would return home safely. For putting the mystery to rest, James Kilroy was awarded a 37-year-old defunct streetcar; he used it to house six of his nine children. Some, however, reported that the first appearance of the phrase was much earlier than James Kilroy claimed. It was apparently found in a vault in Fort Knox that was locked in 1937 and remained unopened until the '70s. 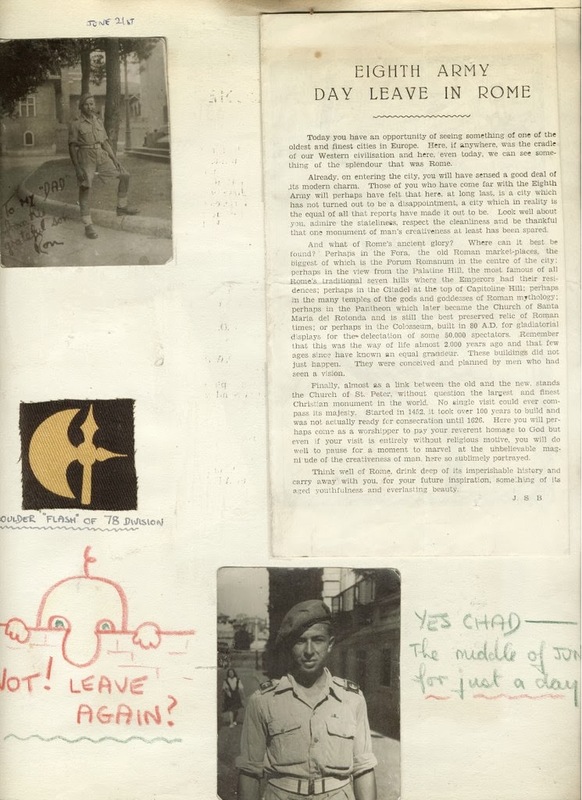 The "Kilroy" illustration began as the English cartoon Mr. Chad, who often found himself attached to "WOT! No____?" lines (e.g., "WOT! No Petrol? "); it was a humorous way of bringing attention to serious shortages and rationing during World War II. The exact origins of Mr. Chad are unclear, but many suggest that the drawing is linked to a diagram representing an electric circuit. Some also claim that it was created by a British cartoonist George Edward Chatterton. Wherever it came from, it began circulating in the early 1940s. 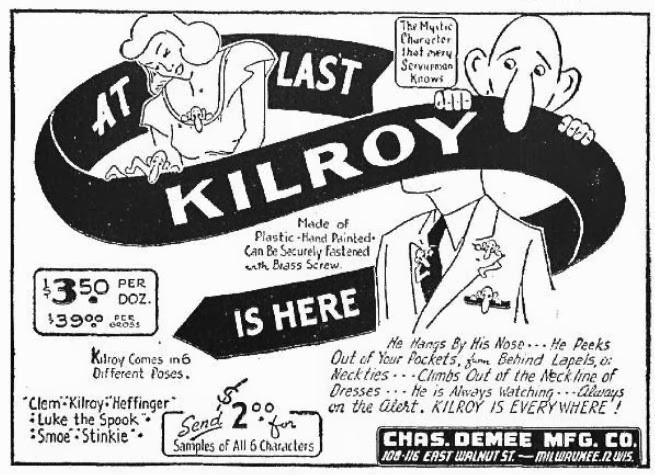 Though no one can say exactly how, Kilroy and Mr. Chad teamed up sometime during World War II, and the result was a plucky and ambitious little cartoon that traveled the world and is still recognizable to many today. 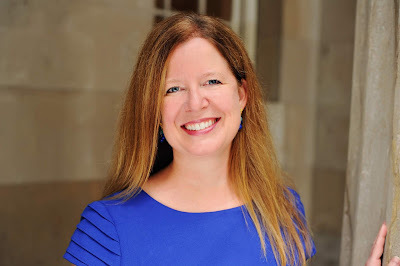 Click here to buy tickets and learn more about Underneath the Lintel.